Considering a storage rental in Bonita, CA? Regardless of how much extra space you might need in 91902 (or surrounding zip codes), Big Box Storage has the perfect storage solution to fit your needs. Backed by a best price guarantee, the company provides convenient, affordable services throughout Bonita as well as storage in Chula Vista and storage in San Diego. In renting a storage unit from Big Box Storage, you’ll not only save money, but also valuable time. Each of the company’s storage containers (referred to as “Big Boxes”) have dimensions of 8 ft. x 5 ft. x 7 ft (length by width by height) and generally hold contents of up to 1.5 rooms. One or more Big Boxes can be delivered directly to your Bonita home or business. You’ll be pleased to note that the storage delivery and pickup fee is waived based on a 3 month minimum storage stay. Once you’ve completed the loading of the Big Boxes (take as much time as you need), a company driver will then promptly return to retrieve it and transport it to the company’s storage facility in the Bonita area. Accessing your storage at the facility is always available seven days per week (major holidays excluded). 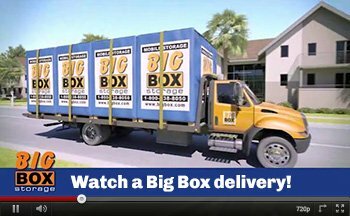 Whenever you decide that you no longer need the storage rental, simply call Big Box Storage at 619-436-5020 to schedule a re-delivery of your Big Box. Whether you’re still at your same Bonita address (as the initial delivery), a new address elsewhere in San Diego County, or any address across the country, the Big Box can be conveniently re-delivered right to your home. 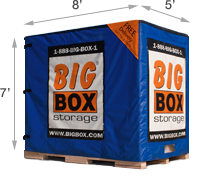 Big Box Storage offers the guaranteed lowest storage rates in Bonita (as well as San Diego County). Additionally, save $25 today by scheduling your Big Box online or you may also do so over the phone by calling 619-436-5020. Representatives are available daily from 7:30am to 6:30pm.